Our readers have many questions about audio production and we want to help you find the answers. Consider this a living document — we’ll continue to update it with answers from NPR Training and other experts in the public media community. Have a question we haven’t answered? You can drop us a line via Twitter, email (trainingteam@npr.org) or on our “ask us“ page. We discussed best practices and answered audio production questions. View it here! Do you have the ears of an audio producer? Identify problematic audio, learn how to prevent the most common problems and recognize when it’s time to call for help with our ear training guide. Simply put, if you don’t wear headphones, you can’t hear the problems you need to prevent. Wear your headphones, whether you’re in the studio or outside in the field! In the studio, do you recommend mixing with headphones over studio monitors? —Adam R.
Do both! It can be really helpful to check your audio on multiple sources. But, of course, we don’t all have recording studio-grade monitoring equipment, so we have to learn to use the tools we have. A quality set of headphones will help you hear details (like fades and breaths) and problems (like plosives and bad edits) that you might otherwise miss. Speakers — even laptop speakers — are good for judging balances when you layer multiple elements together (like voice-over ambience or voice-over music). You should also employ the rock-and-roll mixing trick to get your balances right. Turn your listening level down so that the words are just barely intelligible — so far that you have to really focus to hear the words. This will remove the listening environment and many perceptual issues from your listening experience and help you hear differences in level much more easily. Are there good wireless options for headphones, or do you find that wireless decreases audio quality? —Danielle S.
Is noise canceling needed in headphones? —Rebecca H.
Buying a set of headphones — especially for podcast and music listening — is a personal thing. Size, shape, style, portability and a host of other factors will influence your choices. While you certainly don’t need an audiophile-grade set-up, a pair of headphones has to be good enough that you can hear common recording and editing problems and make decisions about your audio. Quality: This might be obvious, but your headphones need to be of a quality that’s better than the earbuds that came with your phone. While you certainly don’t need an audiophile-grade set-up, a pair of headphones has to be good enough that you can hear common recording and editing problems and make decisions about your audio. Isolation: When you work in the field, you need to be able to hear exactly what it is you’re recording. You want your headphones to provide at least a moderate level of isolation. For that, you’ll need a set of closed-back headphones that either sit on the ear or around the ear. Extreme isolation isn’t necessary — and in fact may be disorienting — as you’ll be removed from the sound of your voice and the world around you. In the studio, you want to prevent headphone “bleed” (the sound of your headphones leaking, or “bleeding,” into the mic). For this, the headphones need to fit tight to your ears without causing discomfort. Portability: You don’t want to buy a pair of headphones that you’ll dread carrying with you! The cans should fold up or store nicely, preferably in their own bag. They should have a cable that is just long enough to reach your recorder without turning into a pile of spaghetti. Coiled cables can help to make things more manageable (but they don’t always solve the length issue). Parts: The ability to replace parts (like ear pads) is a big plus. Ear pads will wear out, cables will break and adapters will get lost. You want to be able to easily pick up new parts a couple of years from now. While earbuds may provide isolation and portability, a quality pair of earbuds (i.e. not the ones that came with your phone) will run over $100. They can also isolate too much, making it hard to talk. And earbuds often transfer handling noise up the cable to your ears, causing you to hear every time the cable moves or slaps against something. Finally, noise-canceling and wireless headphones are not recommended. Both require some sort of power and whether they are rechargeable or powered with replaceable batteries, it means one more item to manage every time you go out in the field. You don’t want your headphones conking out because you forgot to charge them! Noise-canceling headphones use additional electronics and phase cancellation to remove the noise. And because you want to clearly hear what you’re recording (including the noise! ), the noise-canceling could get in the way. Additionally, to keep cost down, noise-canceling headphones usually focus on eliminating the noise instead of achieving a high sound quality. Bluetooth (wireless) headphones are wonderful for portability, but they reduce audio quality to make the file size small to stream from the player to the headphones (similar to how MP3s work). Because of that, wireless headphones are definitely not recommended. How much do you realistically need to spend for a good pair of headphones? You want to use headphones that will help you hear audio problems. A quality set will run you about $80-$100 a pair. The issue of levels brings up all sorts of questions, mainly: What level should I aim for? When working with normal speech, a great target level is -15 or -12 dBFS (use whichever is marked on your meter). If you have a loudness meter, aim for -24 LUFS. What happens if you are in a noisy environment? Can you record at a lower level that doesn’t pick up the background noise and then push up the gain in the editor? —Pieter D.
Recording at a lower level will not record less background noise. It will simply record — at a lower level — the same ratio of direct sound (your subject speaking) to background sound (all the other sounds in your environment). How do you deal with room tone when raising the volume on passages that are too soft? —Natacha R.
When you’ve got a piece of audio that is too low and you increase its level, the background noise (room tone) will come up with it — there’s no way to separate the two. Usually, the audience is forgiving. The tone of the voice will indicate that the person is speaking quietly or is off-mic and listeners will understand that the level is being raised to help make the voice audible. If you want to get fancy, you can use noise-reduction software to reduce the background sounds on the part that’s raised. To prevent this problem, keep your microphone close to your sound source and record at a proper level. By using the idea of “get close, stay close” you can ensure your microphone picks up more of the direct sound of the thing you want — and less of the background sound that you don’t want. Recording at a low level may also introduce hiss from the electronics in your recorder. Be sure to record at a proper level (usually around -15 to -12 dBFS). We touched on this in the webinar on Ear training for audio producers. I like to edit in Pro Tools, but I can’t afford loudness plugins. I do have access to Audition and Hindenburg. Would it be worth it to record narration in one of those programs [using a loudness meter] and then import that into Pro Tools? —Peter E.
Loudness meters are a fantastic way to achieve consistent levels in your recordings and mixes. The more recent versions of Audition and Hindenburg come with loudness meters built-in, but Pro Tools doesn’t. The workflow outlined above will work just fine. However, there are some low-cost (and even free) options available for Pro Tools that will save you the hassle of jumping between editing platforms. Check out the Audio Producer’s Guide to Loudness at Transom for more on why you should use loudness meters and where to find plug-ins. We want to hear from you. Send us your questions about audio production and public media storytelling. What do you think of utilizing compression or limiting to bring levels to a more consistent place without the use of automation? —Adam R.
Compression and limiting are very powerful tools that can quickly go awry. These tools are meant to control and reduce dynamics, but if set improperly they can result in an unnatural sound. You have to get specific, technical settings like ratio, threshold, attack, and release just right for each voice — and there is no one-size-fits-all solution. In typical audio storytelling productions, compression should be used to obtain a more controlled sound. It should not be used to avoid the use of manual leveling — in fact, if compression is used to the point where manual leveling is no longer necessary, odds are the sound will be unnatural. The best way to achieve a natural sound is via manual adjustments using level automation. If compression is to be used, keep to very low ratios (1.5:1, for instance), with reduction of just 3-5 dB. For more, check out this excellent animated guide to compression and Transom’s guide. What about normalizing to control levels? —Rich H.
There are two kinds of normalization — peak and loudness. Peak normalization will make a gain adjustment based on the electrical values of the highest peak in a piece of audio. It considers the peaks of the waveform only, not how the audio actually sounds. Loudness normalization, however, uses perception to make gain adjustments based on how the audio actually sounds. It can be used as a tool to put a final mix in spec or to get individual elements in a mix to similar levels. Read more about loudness normalization in The Audio Producer’s Guide to Loudness at Transom. Should I record levels really low to avoid distortion? You can try this, but odds are you will end up with a hissy recording. Most field recorders sound best when recording speech levels around -15 or -12 dBFS. Sometimes trying a different microphone (like moving from a dynamic mic to a condenser, or from a mic with a lower output to a hotter output), can help alleviate that issue. Unless you have a high-end recorder, it’s probably best to capture at a low level only when the environment demands it (like when you are in a very loud, chaotic scene). Microphones are the common denominator in audio production. They can shape the sound of your recordings more than any other tool. Why does NPR use the Neumann U87 over other condensers? —Caleb C.
You can learn about some of the decisions behind the NPR sound in this Current interview. Which microphones for which situations? —Rick H.
Is the shotgun mic a crucial piece of equipment? I own a standard handheld interview microphone. —Rebecca H.
How about cardioid mics? —Wendy S.
There is quite a bit to consider when choosing a mic for field work. Cost, mic pattern, and preventing common problems all come into play. To learn more about mic selection, check out What mic should I use? Follow it up by reading about the choices others have made. What about lavalier mics rather than shotgun mics for interviews? —Elizabeth D.
Lavaliers (or “lavs”) come with some big caveats. They are highly susceptible to clothing rustle. Placement of the mic is typically on the chest, far away from the mouth, so the sound tends to be slightly muffled. They usually don’t do a good job of rejecting other sounds, and you also have no control over where the mic is once you pin that lavalier to your guest. You should also consider perspective and how important it is to your storytelling. A lavalier pinned to your subject will never convey perspective to your audience. No matter how far away your subject is, they’ll always sound like they are right next to you. If perspective is important, stay away from lavs. Unless you have an extenuating circumstance (safety or access concerns, perhaps), stick to your handheld mic. Learn more about mic selection in What mic should I use? How do you prevent the sound from hand fumbling with the mic? —Lishka D.
[Do you recommend using a] pistol grip for the microphone to prevent noises from mic handling? —Philippe C.
A pistol grip — basically a shock mount with a handle — is the exact thing you want to use to avoid handling noise. 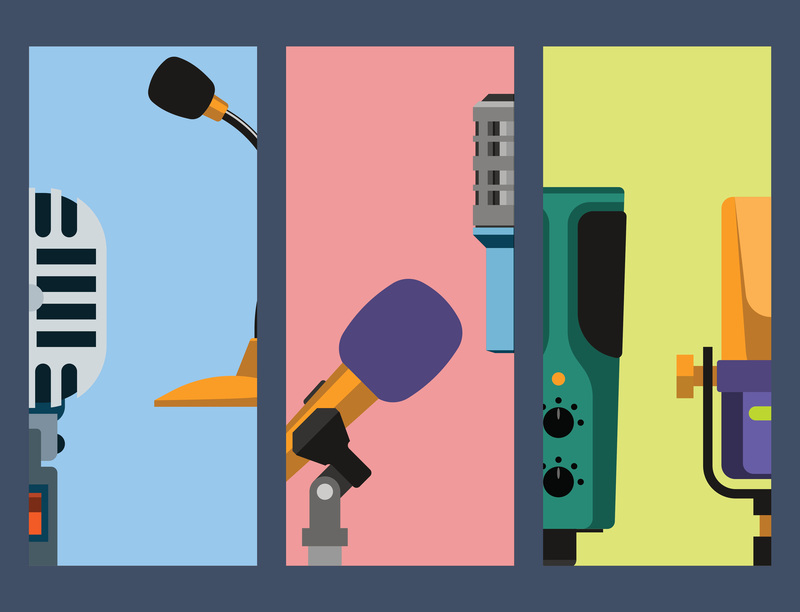 Learn what handling noise sounds like and find some links to common pistol grip models in this NPR Training guide to mics. What do you think about pop-filters? —Caleb C.
Pop filters are fantastic! Whether they are foam “clown noses,” larger wind protection or filters specially made for studio mics, they can be very helpful in cutting down on plosives. But don’t let their effectiveness fool you. Even the fanciest of pop filters will allow pops through. Mic placement matters! I’m curious about additional training. I tried doing an in-depth training online on audio engineering and mixing, but it was still quite hard for me to grasp some of the more mathematical/scientific aspects of audio. For those of us who don’t have degrees in audio engineering — can you recommend any additional reading materials or learning resources? —Erika R.
You’re already at one good place: npr.org/training. Browse the Audio category or search for a specific topic. The “Basics” series from Transom is also a great resource. You should consider finding a local mentor. There is nothing better than getting hands-on training from a skilled professional. Books by Rumsey & McCormick or Bartlett may be helpful, but will often start with a heavy foundation in physics and move on to aspects of music production. What can you do about sibilance (“esses”)? See the Ear Training Guide for Audio Producers for help with sibilance. Can recording in a car work well (with the ignition off and the windows rolled up)? That can work well in a pinch, if you have nowhere else to go. Cars are pretty decent at isolating you from outside sounds. You will probably end up with a boxy sound though — your voice will resonate in the car and it will sound like you are, well, in a car. You can try using a jacket or blanket over your head in the car to help cut down on some of the reflections. Keep the mic close to your mouth (using good mic placement to avoid p-pops) and use a directional microphone. How can you prevent mouth noise? Check out the section on mouth noise in the Ear Training Guide for Audio Producers. When audio fails the DIN test, but the audio content is crucial to the narrative, what’s the best course of action? 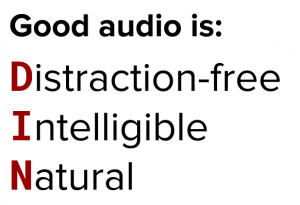 The DIN test defines good audio as distraction-free, intelligible, and natural. You can use it to make judgment calls about the usability of audio. But what happens if your audio fails the DIN test, yet you absolutely need the audio to tell the story? Well, if you need it, you need it. But do your best to learn from the situation and prevent the problem next time! Is there a good resource to learn more about best practices for a high-pass filter? —Carol A. Yes! AIR deals with high-pass filters in Don’t Fear the Filter. What about recording the room while it’s quiet? One minute of room sound? —Becky M.
Yes, yes, yes! Recording room tone (or “ambience“) is absolutely necessary. You can use it to hide edits or maintain a location under tracks. Check out the sections on abrupt entrances and exits in our ear training guide. What do you want to know about public media storytelling? This post is the result of reader questions. We want to hear from you next. Have you always wondered which mic you should use in ‘X’ situation (by the way, we already answered that)? Want to know what you need in a Facebook Live kit? Anything goes — we just want to know what you’re curious about. Send us an email — trainingteam@npr.org. Rob Byers was a Production Specialist with the NPR Training team, where he focused on audio engineering. Thanks to NPR audio engineers Andy Huether and Neil Tevault for their help answering these questions. Be sure to check out our webinar about common audio problems and check out the ear training guide for audio producers for even more help and production tips.